Free concerts in Pilsen Sept. 16 and Millennium Park Sept. 19. A subscription season that opens Sept. 23-28 with concerts featuring a Berlioz double bill: Symphonie Fantastique and Lelio with French actor Gerard Depardieu as narrator. A concert version of Verdi’s Otello in April 2011, and Mahler’s Symphony No. 9 to close the season two months later. The Chicago Symphony Orchestra, which announced full details of its 2010-11 season Thursday afternoon, is rolling out a lavish welcome mat for Riccardo Muti, who becomes the orchestra’s 10th music director in September. The CSO unveiled the season before a large audience at a press conference Feb. 25 in the second floor ballroom of Symphony Center. The event was streamed live over the Internet, and Muti, speaking in his customary joking, relaxed manner, was on hand. The 68-year-old Italian maestro flew to Chicago for the day between performances of Verdi’s Attila at the Metropolitan Opera where he is making his long-delayed debut. The CSO’s 2010-11 season offers an enticing glimpse of what Muti hopes to offer during his five-year contract with the CSO. At the press conference he spoke of his interest in concert opera, new music, community involvement and the goal of offering audiences a full spectrum of classical music’s riches, from Baroque gems to newly composed works. “It is important that the orchestra gives a panoramic view of music,’’ he said. Muti’s first concert as CSO music director will be a free concert Sept. 19 in Millennium Park’s Pritzker Pavilion. He will be in Chicago for 10 weeks of subscription concerts Sept. 23-Oct. 17, 2010 and Feb. 2-19, Apr. 7-12 and May 5-13, 2011. 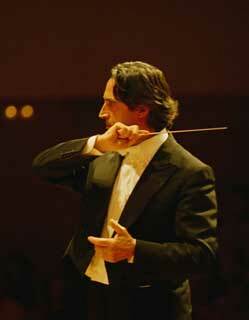 His repertoire includes two bona fide blockbusters: the Berlioz double bill in September and Otello in April 2011. Both will be repeated during the CSO’s three-concert residency at Carnegie Hall in April 2011. A few common threads run through the CSO’s next season. Along with a network of Chicago institutions, the CSO will honor the 200th anniversary of Mexican independence and the 100 anniversary of the Mexican Revolution. A series of concerts on the theme “Mexico 2010” is planned, including performances led by Muti of Carlos Chavez’s Sinfonia india. A CSO commission, Danza Petrificada’ by Bernard Rand that Muti conducts Oct. 14-17, is inspired by Mexican folk music and the poetry of Octavio Paz. But Muti has his doubts about the kind of thematic programming currently popular with American orchestras. “I don’t believe in themes,’’ he said bluntly. “A season based on a theme is extremely boring.’’ Rather than performing every last Haydn symphony or the complete works of Mozart, he said, orchestras would do better to delve deeply into each composer’s best works Or, better yet, he said, they should build programs that helped audiences discover unexpected links between works. Muti pointed to his Berlioz double bill, which re-unites works Berlioz intended to be performed in tandem, as a step in that direction. Turning to contemporary repertoire, Muti will conduct works by British composer Anna Clyne and American composer Mason Bates, rising young talents whom he chose to become the CSO’s newest composers-in-residence. Clyne’s <<rewind<< is scheduled for concerts at Symphony Center Feb. 10-15 and Apr. 8, 2011. It will be repeated Apr. 17 at Carnegie Hall in a performance that also includes Varese’s Arcana and Shostakovich’s Symphony No. 5. Bates’ The B-Sides, Five Pieces for Orchestra and Electronica, will open Muti’s CSO concerts Apr. 12-13, 2011, at Symphony Center. Among Muti’s guest soloists with the CSO in 2010-11 will be pianists Mitsuko Uchida and Leif Ove Andsnes and violinist Vadim Repin. Yo-Yo Ma, recently appointed the CSO’s creative advisor, joins the orchestra and Muti May 12-13 in the Schumann Cello Concerto. The season includes three CSO co-commissions. Esa-Pekka Salonen’s Violin Concerto will be performed by Leila Josefowicz under Salonen’s baton Feb. 24-25, 2011. Texan Tenebrae by Mark-Anthony Turnage will head a program conducted by Sir Andrew Davis, music director of Lyric Opera, Nov. 18-23. A new piece by Osvaldo Golijov is scheduled April 21-23, 2011, on concerts conducted by James Conlon, Ravinia Festival music director. Turnage and Golijov ended their tenures as CSO composer-in-residence in June. Anne-Sophie Mutter, a frequent visitor to Chicago for recitals, will perform with the CSO for the first time in nearly two decades. She will be soloist in the Beethoven Violin Concerto under Muti’s baton at the Symphony Ball benefit Oct. 2. Bernard Haitink and Pierre Boulez, who have shared responsibilities as the CSO’s chief conductors since Barenboim’s departure in 2006, will be back for four weeks of concerts in 2010-11. Though he is generally taking a sabbatical from conducting next season, Boulez will be in Chicago for concerts Nov. 26-Dec. 4. His repertoire includes Janacek’s Glagolitic Mass. Haitink will be on the podium Mary 26-June 6, 2011, closing the season with Mahler’s Ninth Symphony. Other guest conductors for the CSO’s 2010-11 season include Charles Dutoit, Kurt Masur, Sir Mark Elder, Sir John Eliot Gardiner, Ludovic Morlot, Antonio Pappano, Michael Tilson Thomas, Jaap van Zweden and rising young Canadian conductor Yannick Nézet-Séguin. Mitsuko Uchida conducts an all-Mozart program in January, and Gil Shaham will appear as violin soloist and conductor in concerts Oct. 20-23 that include works by Mozart, Haydn and Barber. Helmuth Rilling leads a single performance of Mendelssohn’s oratorio Elijah Mar. 11, 2011. The orchestra continues two of its most popular series, Friday Night at the Movies and Beyond the Score. Muti, who counts Nino Rota, a distinguished composer best known for his film scores, among his mentors, hinted that Rota’s music could turn up on future CSO seasons. No overseas tours are planned for 2010-11, though there will be concerts Oct. 21 at North Central College in Naperville and Oct. 30 at the Krannert Center at the University of Illinois in Champaign-Urbana. Deborah F. Rutter, CSO president, said the orchestra wanted to “concentrate on Chicago’’ next season. Overseas touring will resume in 2011-12, she said. Great to get Anne-Sophie Mutter, violoniste extraordinaire.